The International Dental Show (IDS) is opening its doors for the 38th time from 12 to 16 March 2019. Around 2,300 companies from over 60 countries are awaited in Cologne for the world's biggest trade fair for dentistry and dental technology. As such, the entire dental industry is represented at the IDS, including all the international market leaders, which makes it unique in terms of depth and breadth: from dental medicine, to dental technology, infection protection and maintenance, through to customer services, information, communication and organizational materials. Due to its entirety and high number of innovations IDS impressively underlines its significance as a forward-looking trendsetter of the dental industry. 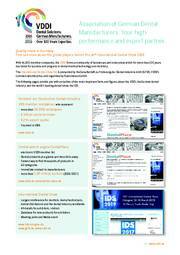 No other dental trade fair worldwide presents such a wide spectrum of offers of dental products and services. IDS 2019 covers Halls 2, 3, 4, 5, 10 and 11, spanning a total gross floor area of over 170,000 m².Not least due to the high number of registrations, the GFDI - the Gesellschaft zur Förderung der Dental-Industrie mbH, the commercial enterprise of the Association of German Dental Manufacturers e.V. 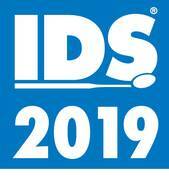 (VDDI) and Koelnmesse are anticipating that IDS 2019 will be able to repeat the excellent result of the previous event also in terms of the number of visitors. 155,000 trade visitors from 156 countries were recorded at IDS 2017.